Unicorn horn cupcake toppers - Etsy is full of them or you can make your own with a bit of fondant. Make box cupcakes per the directions, use your favorite cupcake recipe, or buy pre-made, un-frosted cupcakes. Divide your icing into six separate bowls and tint all but one with food coloring. We used gel colors in purple, pink, yellow, orange, and green, then left one bowl of icing white. Scoop the icing into individual plastic bags, and snip one corner of each bag. Unroll a length of plastic wrap at least 16 inches long onto a clean flat surface. One color at a time, pipe the icing lengthwise onto the plastic wrap, leaving at least a couple of inches on either end. Repeat with each bag of frosting, piping the stripes close together. Roll the plastic wrap lengthwise into a long log, wrapping it firmly. Twist it closed at each end. When you look at the end of the log, it should look like a rainbow of colors all meeting in the center. Snip off one end of the frosting log and insert that end into a pastry bag fitted with a piping star (we used Wilton star tip #4). Now you’re ready to pipe the icing onto your cupcakes. Pipe each cupcake with a glorious, colorful swirl of frosting. Add unicorn horn and ear cake toppers and you’re finished! 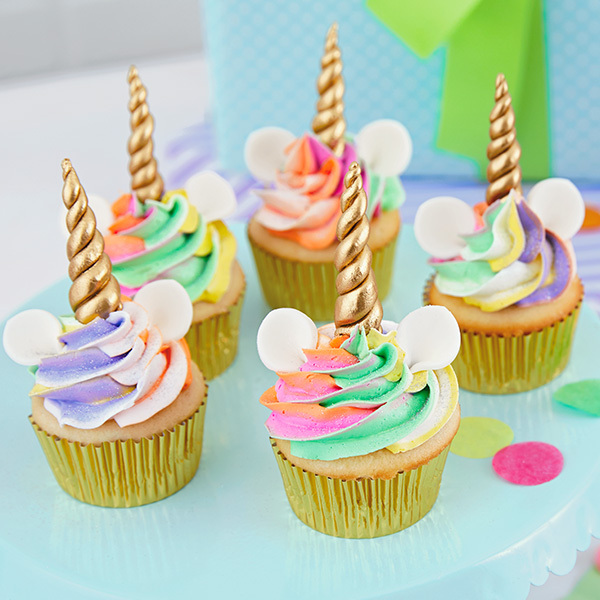 Want to level up your unicorn cupcakes? Bake them in flat-bottomed ice cream cones. Decorate as above, and add faces to the cones with black frosting or candy googly-eyes.